It can be daunting to see just how quickly power between tech products shifts. Almost anyone of us can remember using a Gateway computer and waiting for the dial-up to connect. We have come a long way from hearing that annoying buzzing sound. We entered into the world of faster computers, faster internet, and mobile devices. The laptop still definitely has it’s place amongst all of the other tech devices out there, but the recent introduction of the Hybrid models shows that we are in the middle of a power shift. Both tablets and laptops are now being used as the main computing devices for many people. The adaptation of Hybrids however, might show us how much time laptops have left, or if they are even threatened at all. 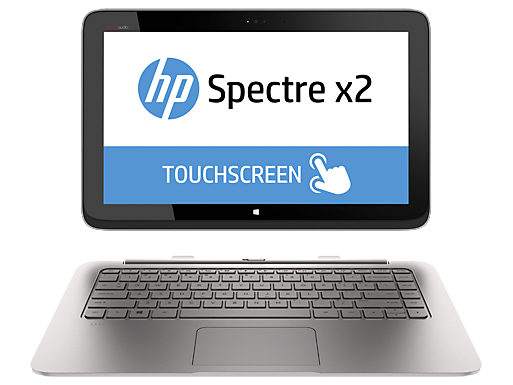 HP has just released a new Hybrid from their Spectre laptop series. 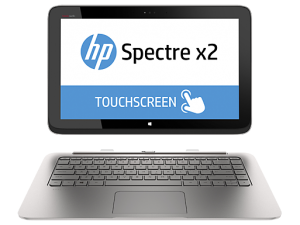 They have essentially taken a 13′ Spectre laptop and let the screen pop off into a very healthy sized tablet. The main goal here is simple; mobility with more mobility. The option of not having to stick to just a tablet or a laptop offers a huge market to cater to. It doesn’t mean anything if the product itself doesn’t work up to its standards however. If we take a look at what is making this new hybrid tick, we will find a pretty reasonable computer. The new hybrid comes stock with a 128GB SSD hard drive, a 1792MB Intel HD Graphics 4200 graphics card, and an Intel Core i5 processor. The screens resolution sits at a beautiful 1920 x 1080 pixel count. 1080p HD displays are never frowned upon. The screen itself is 13.3 inches and the entire system comes equipped with the new Windows 8.1 OS. However the actual trackpad to the keyboard portion of the hybrid can be a bit lacking in the sensitivity department. It is actually so much so that it can make working with the keyboard quite the hassle . When the device is put together in its laptop form it can also be a little top heavy and feel a bit awkward. However, for only $1,189 you can get both a tablet and a laptop. That is not a bad price for what it can offer. Again, seeing how these hybrids are slowly gaining speed makes you almost want to re-examine if the laptop will be here much longer. It might be a bit threatening to laptops, however, the hybrid is not without limitations in itself. Keeping all of the inner workings in the tablet part itself means that the size of the display can limit the power of its components. When you have the laptop, you are able to put more into it. Since you are able to keep the screen as just a screen, you have the body/keyboard to place all of the components into. This space offers a lot more room than simply cramming everything into a screen and offering an attachable keyboard. This is not to say that there aren’t good hybrids out there, but since the limitations of these can be based off of the size, it should be safe to say the laptop will survive. Instead of moving the laptop out of its place now, the hybrid has simply made its own name when it comes to portability.